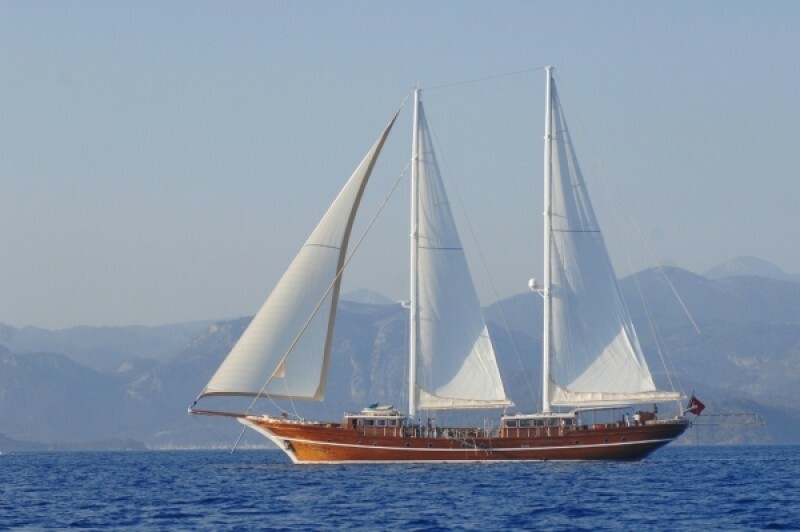 The Marenostrum is an exceptional ultra luxurious crewed yacht and member of the elite class of VIP gulets cruising the Turkish Mediterranean. 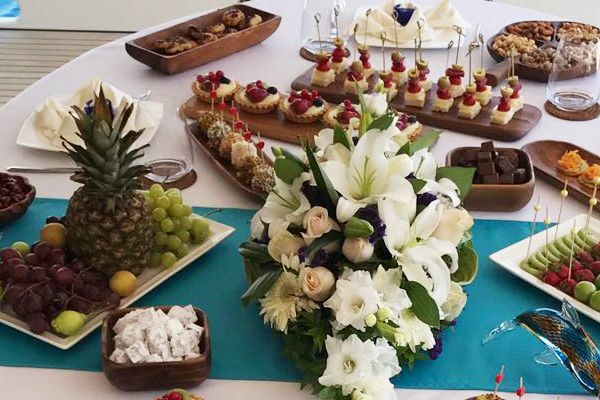 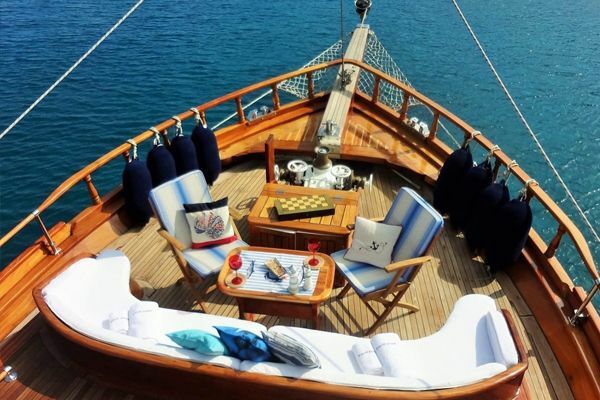 The experienced captains, gulet yacht builders and owners Captain Kadir and son Captain Galip are proud to have honed their gulets to a luxurious degree to please their most refined guests. 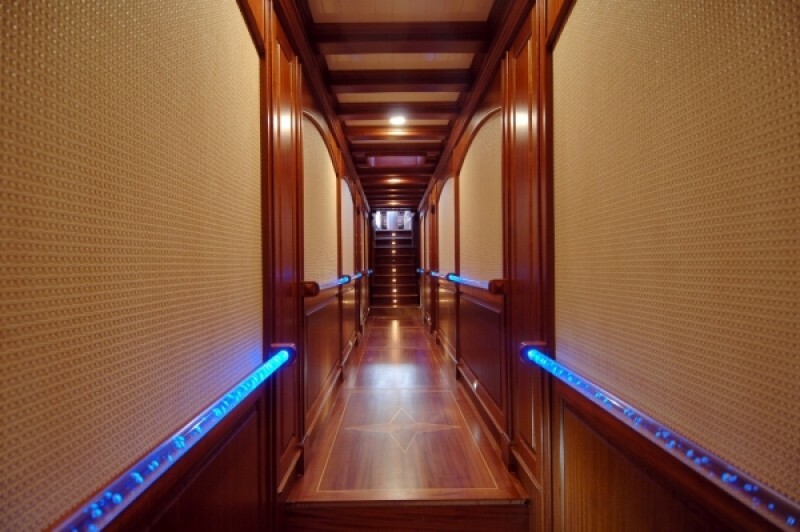 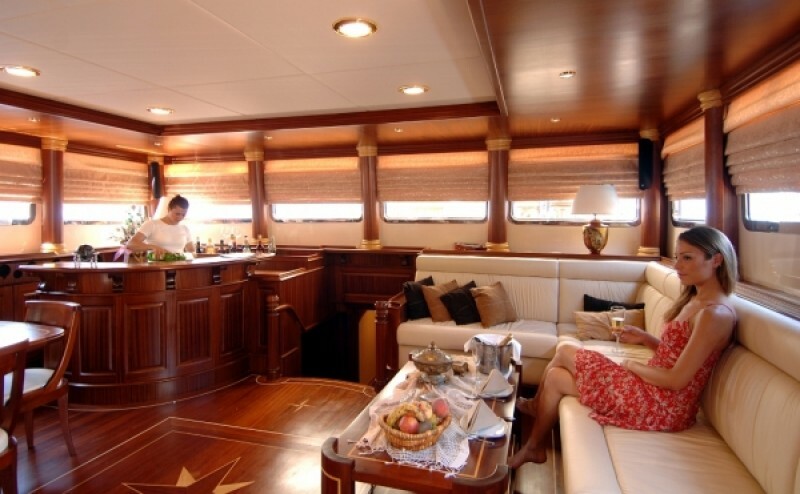 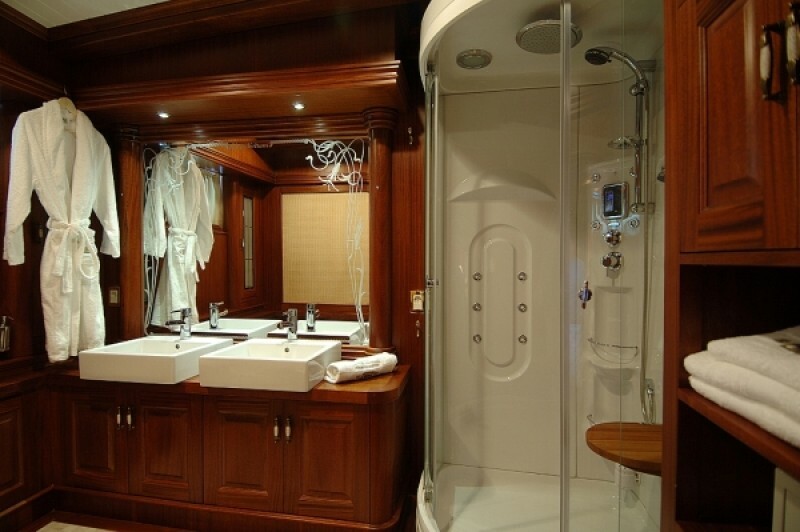 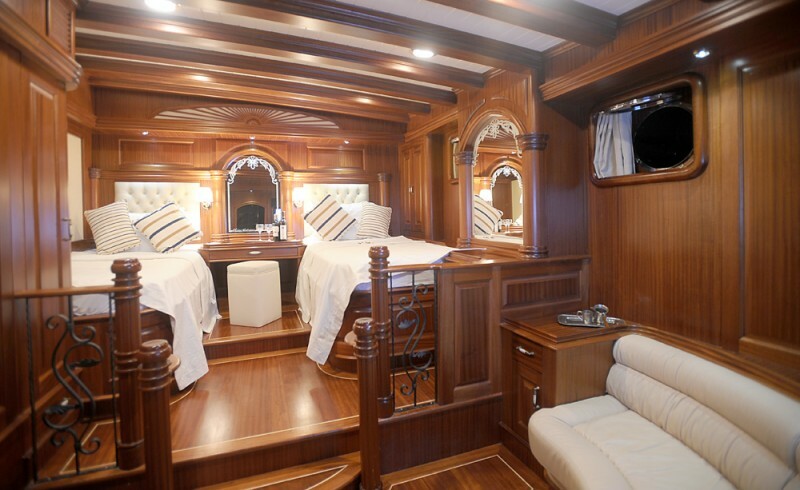 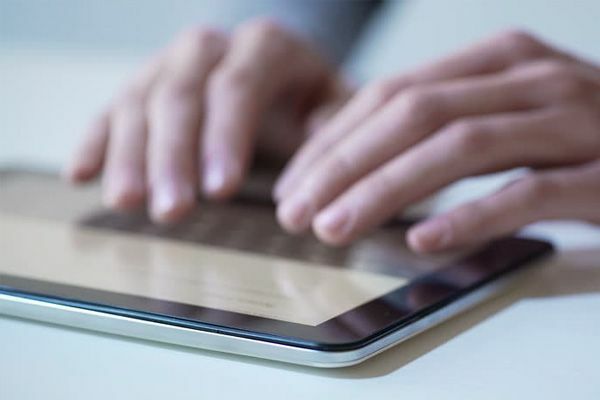 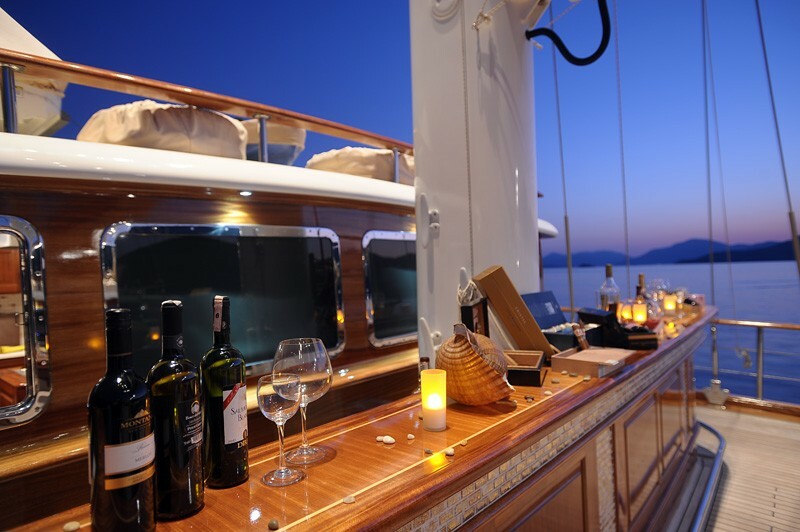 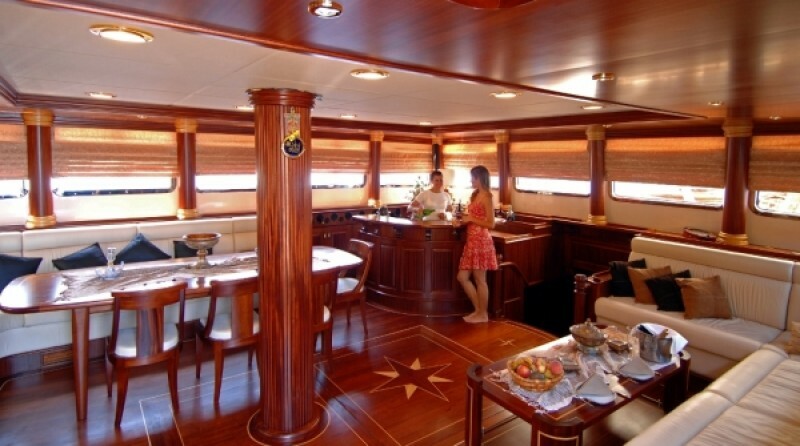 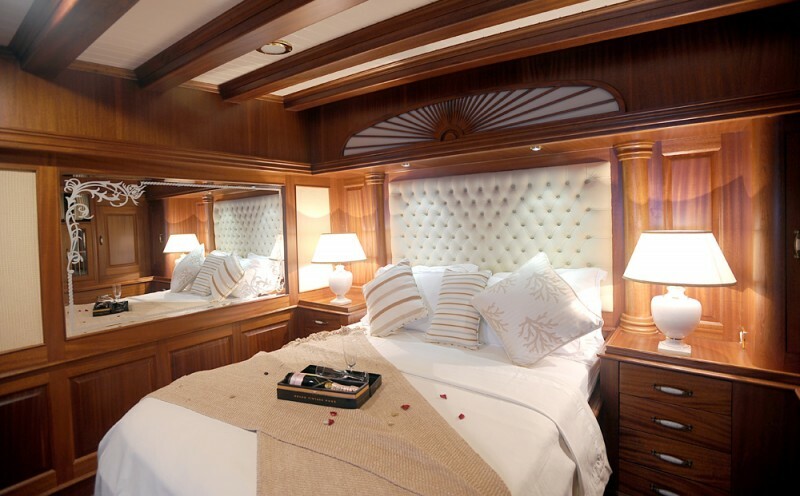 A five star experience awaits the private charter guests as they step aboard the Marenostrum with the attentions of a crew of seven who combine high class service with hospitality, and friendly professionalism to attend to every need. 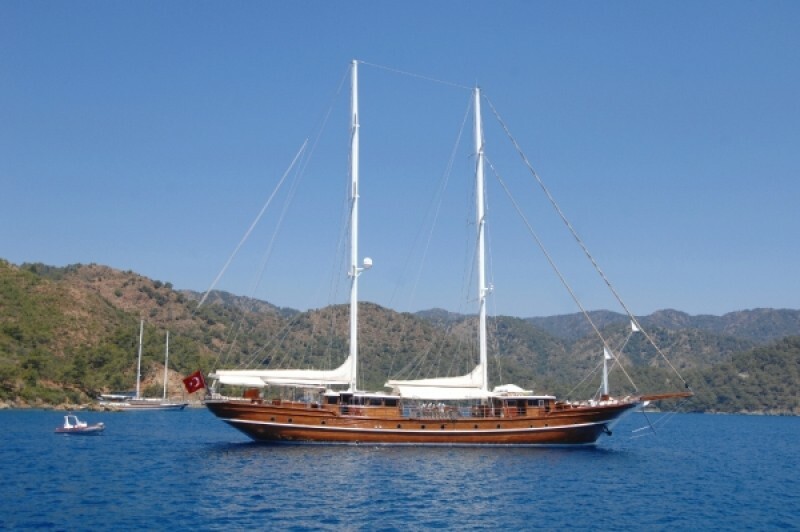 Exclusive gulet Marenostrum has been designed, decorated and fitted out to a high standard of luxury with unsparing attention to comfort and security. 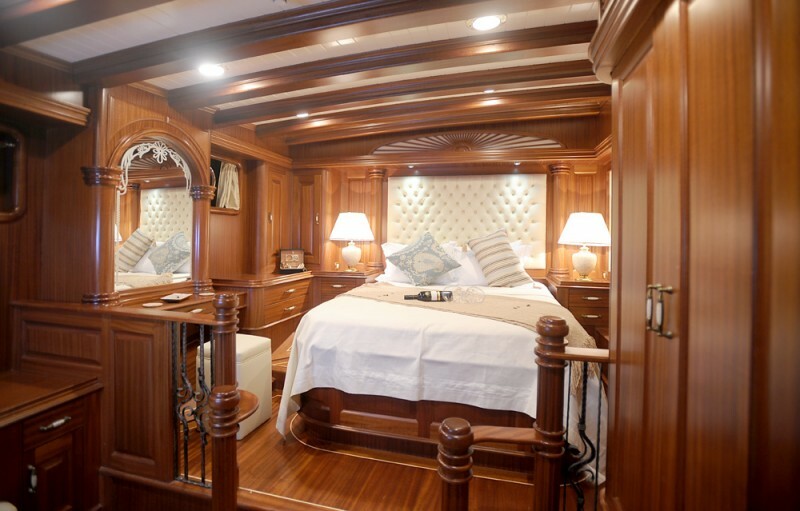 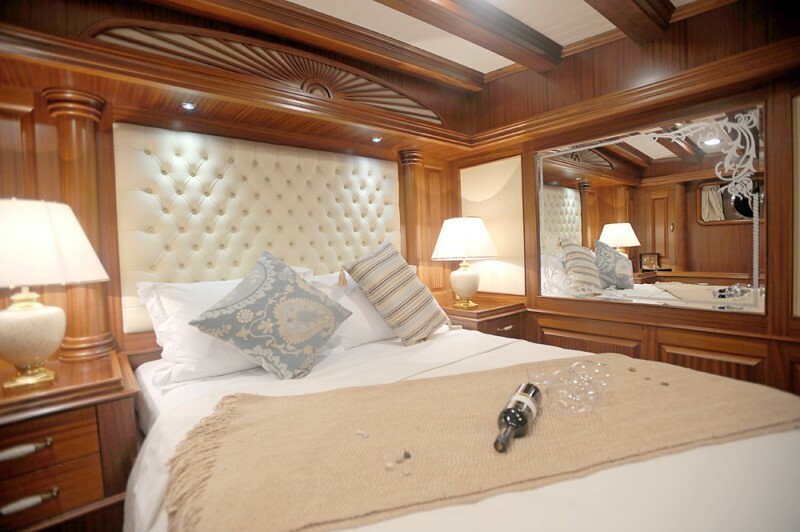 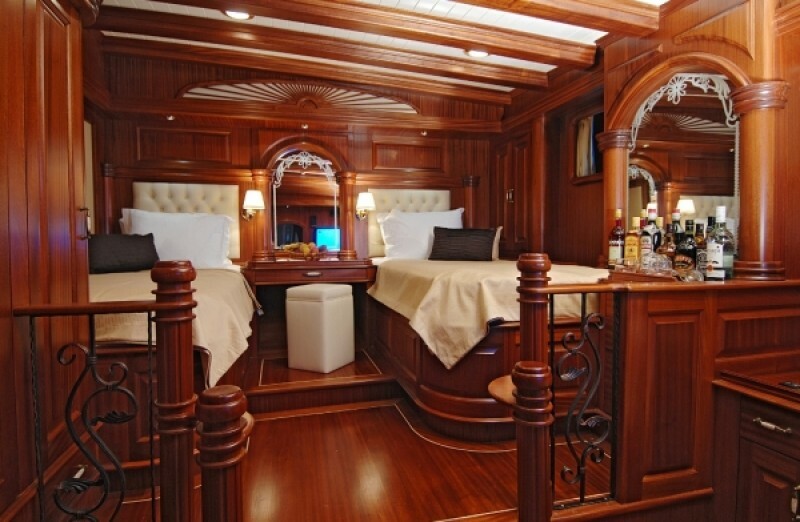 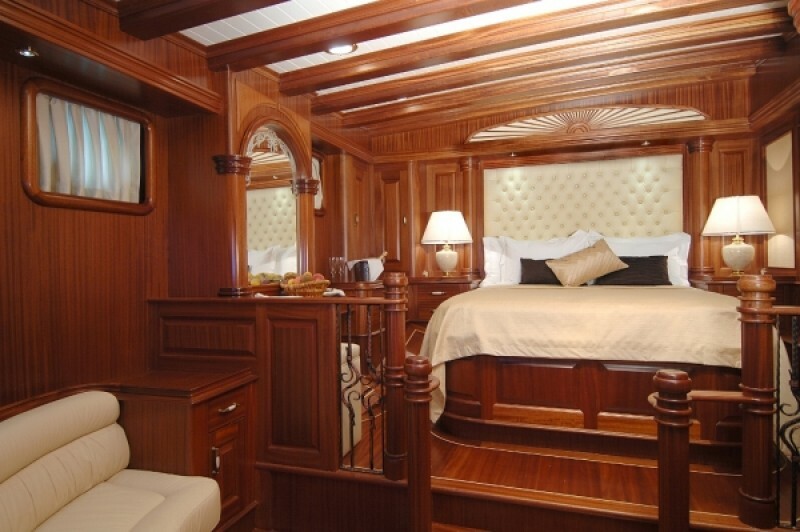 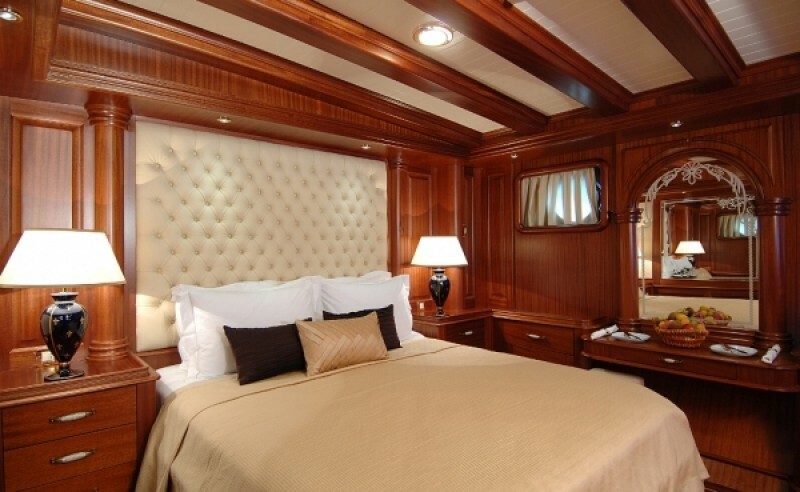 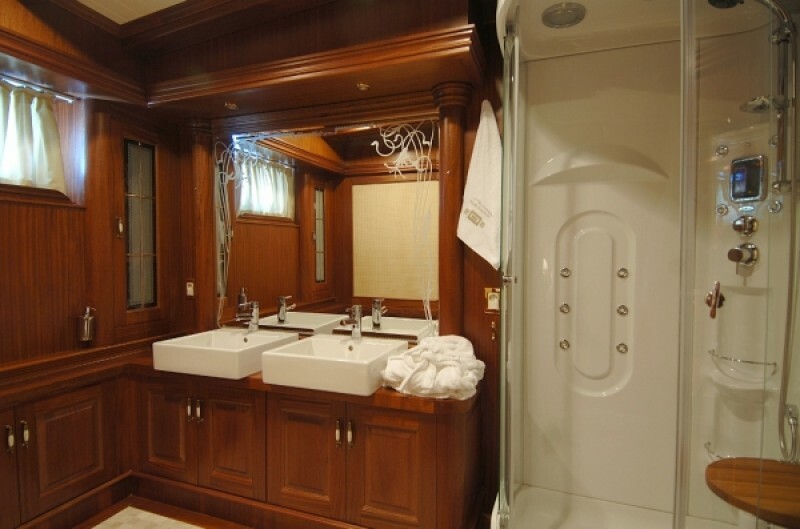 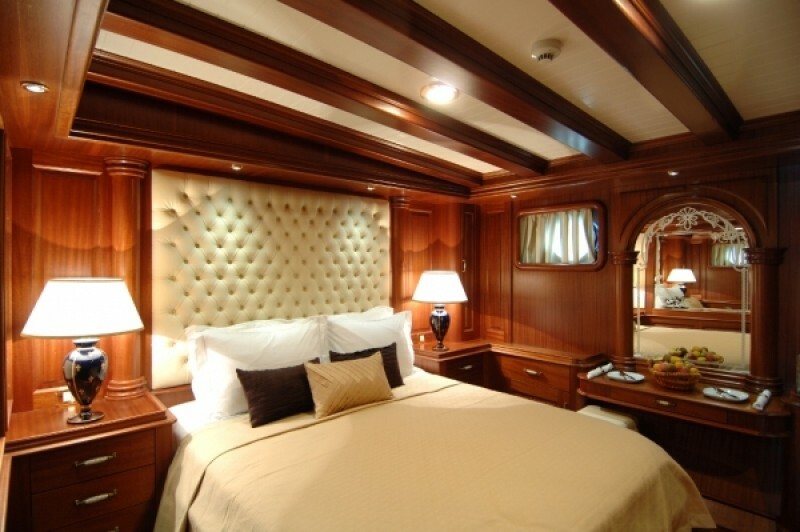 Each of the spacious equal-sized staterooms reveal beautifully carved mahogany features setting off the comfort and luxury of the cabins. 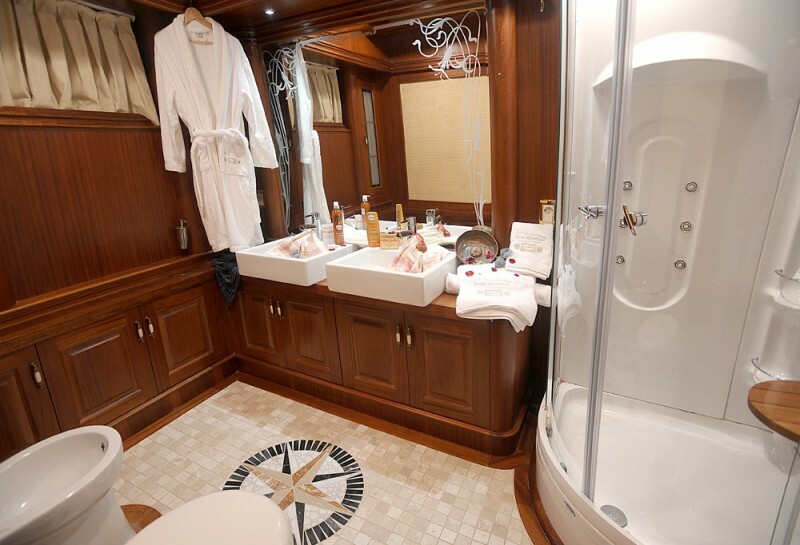 All are equipped with plasma TV, air-conditioning, and en suite bathrooms with hydromassage showers, towelling robes and luxury toiletries. 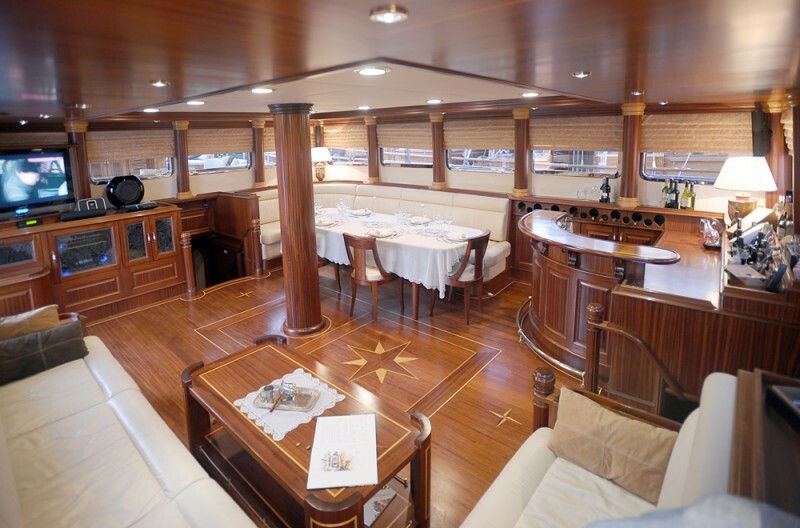 The distinctive design of the spacious deck has two coachouse type superstructures, one forward for the galley and navigation, and one for the elegant and spacious indoor seating and dining saloon. 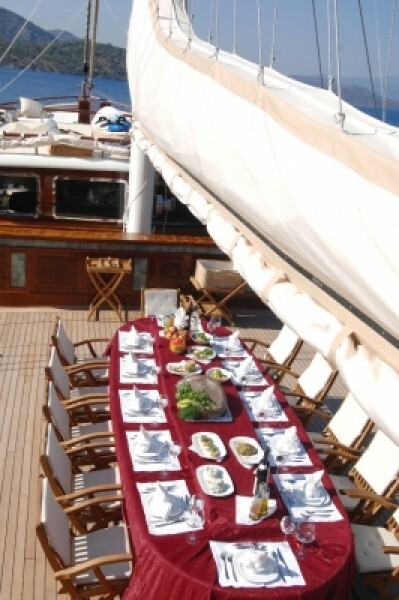 The long outdoor dining table is located between the two masts, inviting guests to enjoy long and magnificent meals dining al fresco under the awnings or the stars. 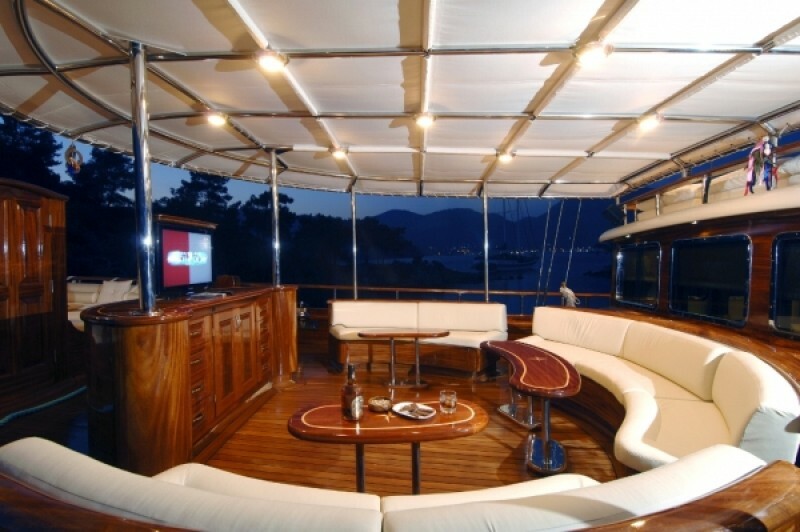 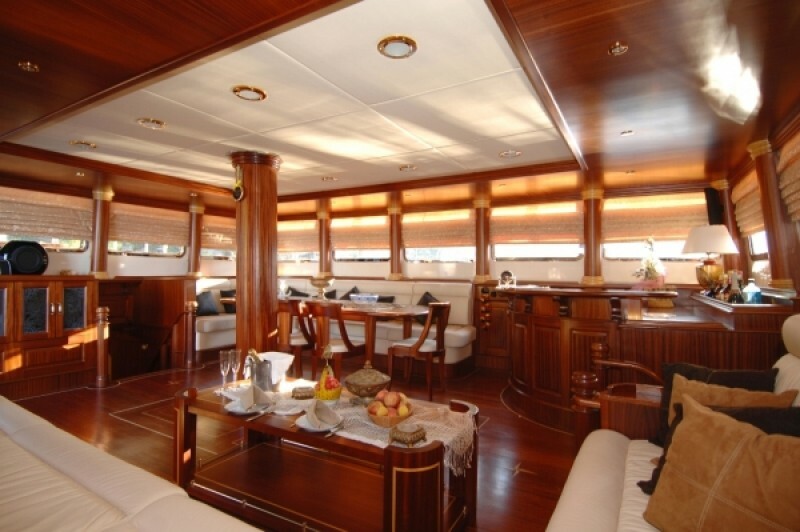 Marenostrum yacht’s aft deck enticing ‘chilling zone’ of curved seating banquettes under the fixed awning forms a relaxation and conversation area complete with pop-up plasma TV, and an expanse of a wide cushioned bench for sun-worshippers further back on across the stern. 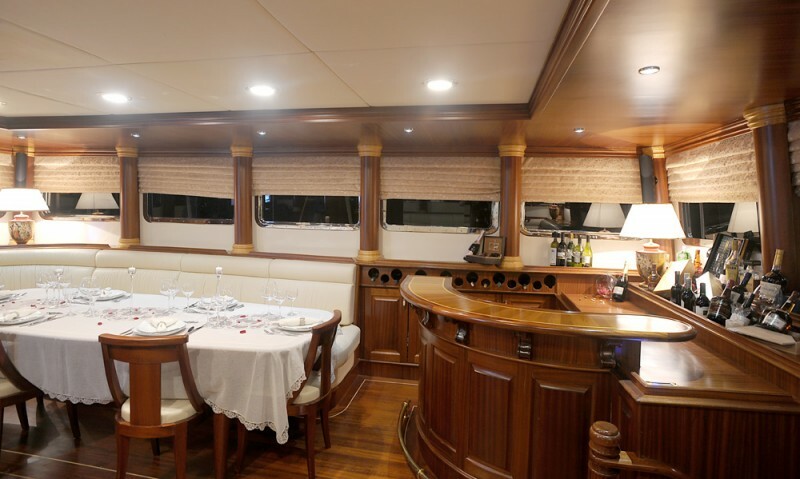 Forward at the bow a comfortable curved seat embraces the popular on-deck jacuzzi perfect for end of day drinks and conversations. 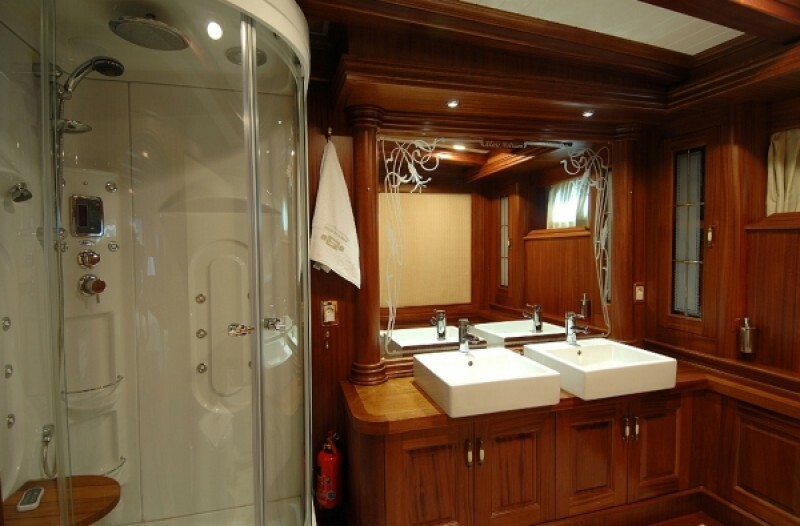 Sunbeds for the serious sunbathers are above the saloon and reached by a stairway. 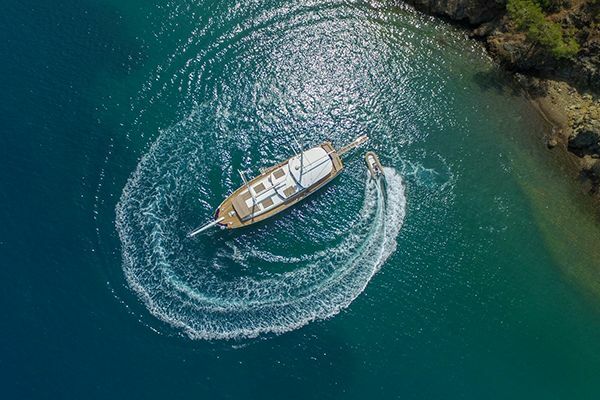 The different areas give a remarkable sense of space and movement around the gulet, allowing for guests both time together and tranquil times. 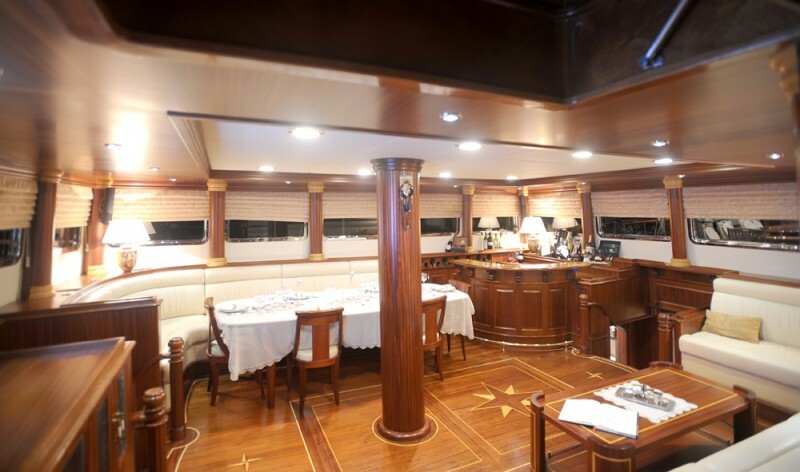 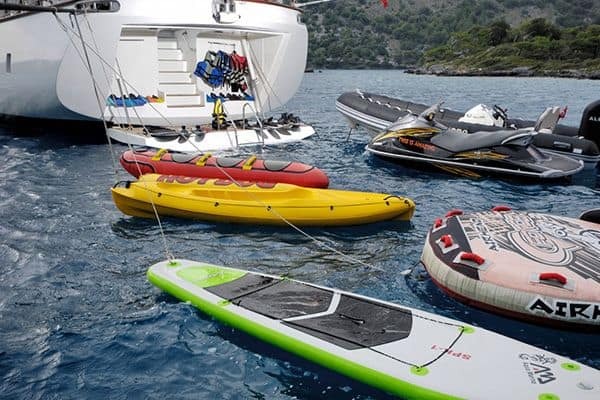 The captain and crew make the guests’ experience complete with excellent but discrete service, presenting superb meals each day, drinks service, cleaning and all sailing, and assisting with all activities, the water sports and exploration ashore. 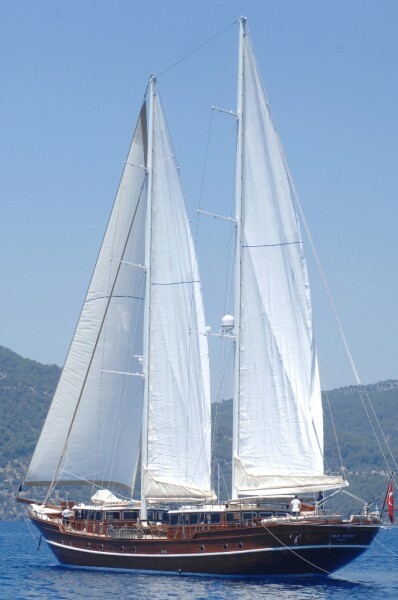 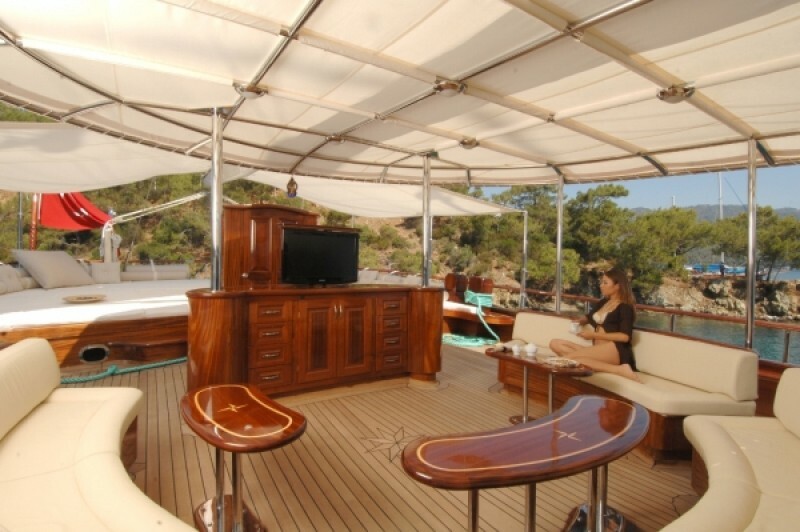 An all inclusive charter on the Marenostrum can only be memorable as it offers the comfort, class, and the excellent service a truly luxurious gulet cruising experience can give. 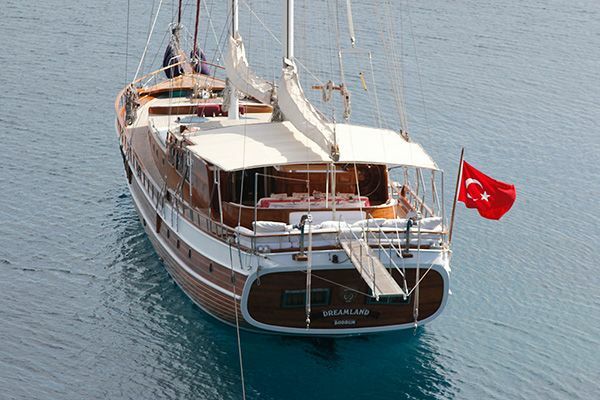 Sail around the enchanting coast and bays of southwest Turkey and into the Greek Islands of the Dodecanese and return calm and refreshed from a delightful cruise holiday.